With so many deaths and moments of building tension, last night’s episode of The Walking Dead seemed more like a Season finale then a regular episode. So with two episodes left this season, we can only imagine how insane things are going to get from here on out. So let’s take a closer look at this week’s episode and flush out every story element, Easter Egg and juxtaposition you might have missed. Definitely one of the more curious titles of this second half of Season 5; but it actually calls to mind a massive Dale quote from the Season 1 episode “Vatos”. There’s been some good Dale references this half season as it was – ie: change RV battery – but this episode title, as well as the last 5 episodes of this fifth season ALL reference the following quote in “Vatos”. This is actually Dale paraphrasing a passage from The Sound And The Fury; but it also paints us a picture of what is going on in this episode arc. It’s no coincidence that this passage begins with the mention of time and these episodes begin with Rick finally setting the ‘time’ on his watch. Everything that follows embodies these ideas as well as the group not only tries to ‘remember’ how things are; but also gets a chance to “forget” and enjoy themselves a bit. Though in the back of their mind, there’s always a though that they’ll have to try and conquer this new paradise; and it is this episode that makes them realizes what they’ll have to ‘spend’ to do it. When you think of the word “Spend”, you think of something you have to pay out in order to get something; and that is exactly what this episode set the price for. From Noah’s death to the group’s reputation, this episode was all about the group and Alexandria paying a price in order to let things “begin”. When Reg Monroe wrote in his book for Noah “This is the beginning” it was meant to symbolize the beginning of a new era of prosperity. After witnessing and being part of some major deaths since his joining the group, Noah wanted to give back and rise into someone who could pull his own weight and make a difference. Little did he know that this would end in his horrific death. Though despite this ‘end’, this episode set up for the beginning of so much. With Noah’s death, Rick’s group will become more mobilized as they just lost one of their own due to the cowardice on an outsider. Monroe’s group will become mobilized more after the death of her own son. Though most apparent of all is that this is the beginning of a Civil War within Alexandria as Father Gabriel has betrayed those who saved him and have now spoken out against them as monsters and ‘false prophets’. With only two episodes left this Season, this is truly the ‘beginning’ of something huge; but hopefully also the beginning of something great in its aftermath. The only remaining question is, ‘how much more must be paid in order to achieve it”? Besides being one of the newer cast members, Noah’s death is incredibly tragic for many reasons. For starters, Beth died so that he might live. 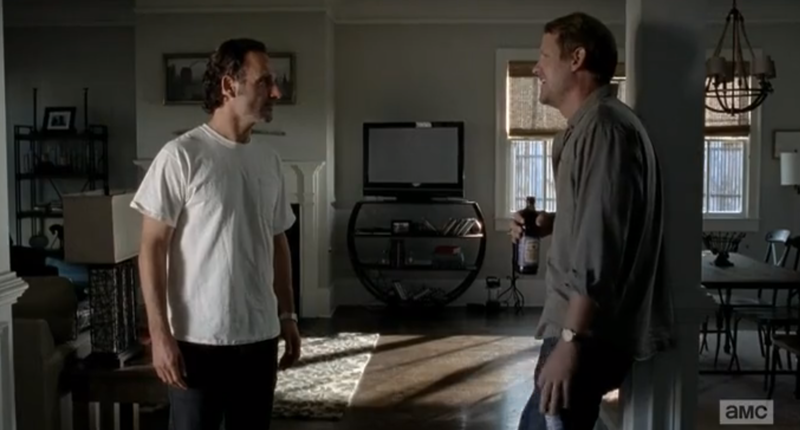 With him dying so soon there is this feeling that Beth’s death was even more meaningless. Additionally, Tyreese technically died because of Noah as well. This is why Noah was so set on giving back and rising to the occasion. He knew all those that had sacrificed for him and he wanted to give back. So by him dying so soon, it is truly the loss of potential. 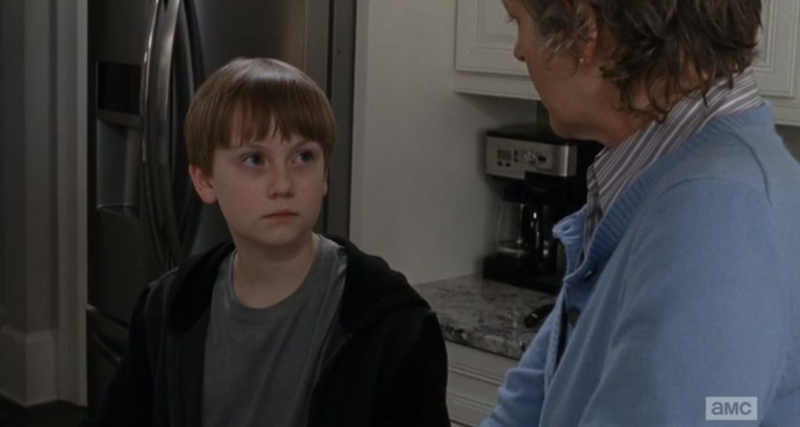 Further more, Noah was very much an early season Glenn. The scene between Noah and Reg had a very Glenn and Dale vibe to it; but this time around it was the student who died early, not the teacher. So Glenn being forced to watch as everything he represents is torn apart makes the situation even more horrific. It also doesn’t help that this is the first time someone has died on Glenn’s watch. He might have saved Rick, Tara and others in impossible situations; but for the first time Glenn now knows the crushing weight of failure. We saw how Glenn was shaken to the bones having to watch this; but thankfully Noah’s final words reminded him of what they were there for. Considering his leg was already halfway out the door, Noah knew he was a goner. So when he told Glenn “don’t let go” it wasn’t a plea or a scared request; but rather a reminder to Glenn to not let go of all they’ve been fighting for. Hold onto Alexandria and what it represents. As Glenn said in Monroe’s interview, they were almost out there for too long. Noah reminds him that they must ‘hold onto’ their humanity and not let go of it. Nicholas fled because of his fears and selfishness; but Noah in his final moments wanted to leave Glenn with advice to not lose hope. Though these weren’t the only two who were juxtaposed this episode. Eugene’s cowardice is certainly no secret; but as we learned this episode, honest cowardice is much better than hidden cowardice. 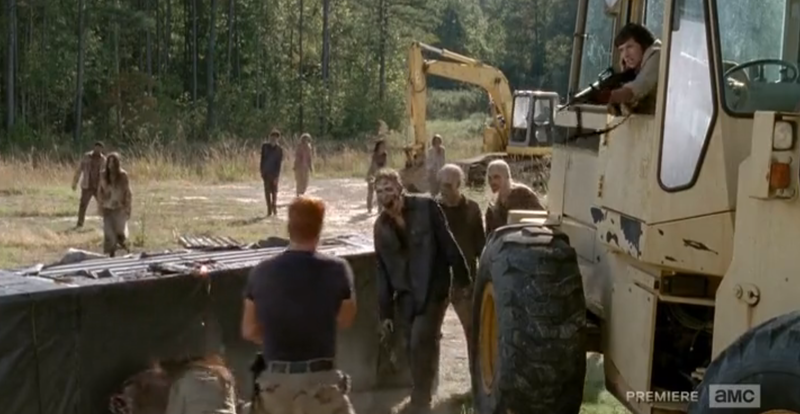 The ongoing protocol at Alexandria seems to be ‘save yourself as let walkers get distracted by a downed friend’ – aka ‘Pulling An Otis’ from Season 2 when Shane used him as live bat. We saw Tobin do this to Francine at the construction sight, as well as Nick do this to both Aiden, Noah, and Glenn. Additionally, we also found out how those people who died in Aiden’s group last time were the result of Aiden and Nicholas being the ones who ‘broke formation’. They’re truly children playing at war, who have no idea of the consequences of their actions. 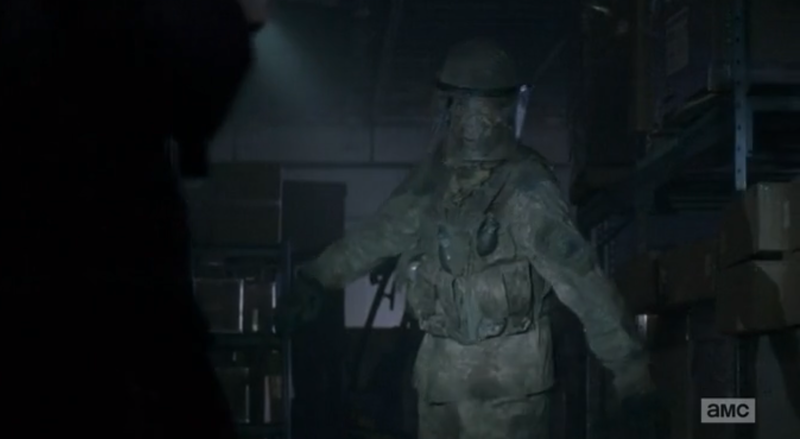 Their refusal to listen to their better’s advice is how the grenade detonate in the first place as Aiden kept shooting a Riot Gear Walker rather than stabbing it. Though while people like Nicholas spent time on abandoning friends, Eugene found his inner strength to protect his one true friend no matter what. Eugene didn’t want to go on that run at all, thinking that propelling them to DC initially was all the work he had to do. Though once Tara was injured he found that he was indeed capable of pulling his own weight – as well as hers. In fact the shot of him peaking out of the door was perfectly framed to make it appear as he was going to run and hide as well; but in fact he fireman carried Tara to safety while shooting any nearby walkers. To make him even more the hero, he used the van and its sound system to draw the walkers away from a trapped Glenn, Noah and Nicholas. Sadly, this distraction led to Nicholas trying to save himself at the cost of Noah; but when Nicholas appeared at the van, Eugene very quickly put together that something was off. 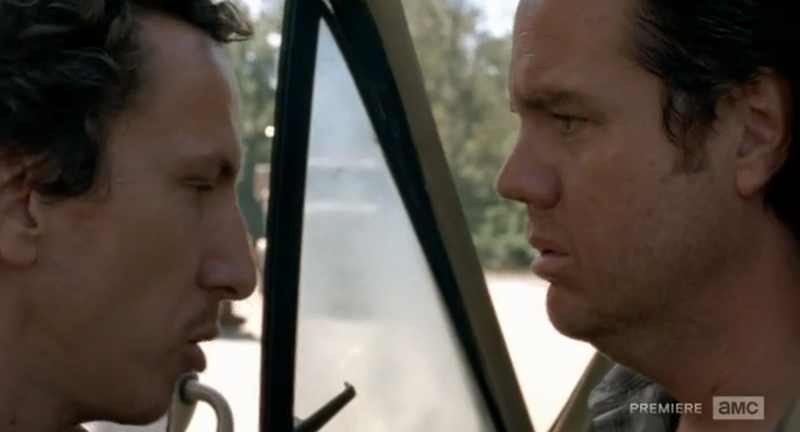 In this showdown between the coward turned fighter and fighter turned coward, Eugene wins and even tries to pull a gun on Nicholas – unsuccessfully – but he does buy enough time for Glenn to return and knock him out. Eugene has finally learned to live in this new world and fight for those he cares about. Tara was the only person he opened up to and probably still has a ‘working’ relationship with after Abraham beat him to a pulp. Though while Eugene was becoming a hero, another member of Rick’s group was becoming a cowardly traitor similar to Nicholas. 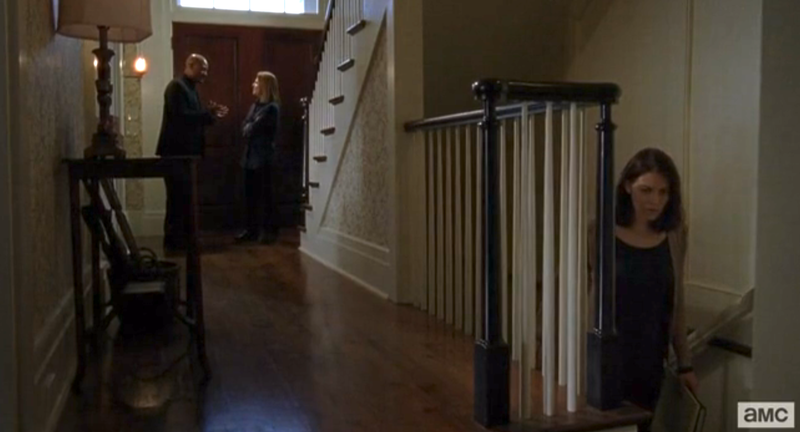 As gruesome and appalling as Aiden’s and Noah’s deaths were, Father Gabriel’s “private” talk with Monroe was probably the most disturbing. Despite being saved numerous times by them, not pulling his own weight and even running away only to return and realize that they were right, Father Gabriel has thrown Rick’s group under the bus with accusations of them being monsters and false prophets. He tells Monroe that they will only think of themselves and don’t deserve paradise. This is all the more infuriating when you realize that all of Gabriel’s accusations are truer about himself and Alexandria than Rick’s group. This is why Gabriel’s accusations of them doing ‘unspeakable things’ is spliced with Carol telling Rick that Pete is beating his wife and child. Similarly, the people who will ‘turn tail and run’ are the residents of Alexandria as we saw this episode and it was Rick’s group who went out of their way to protect others only to lose their own. Further more, Rick and his group have fought constantly and protected 14 people this whole time; while Gabriel abandoned his people and left them to die. If anyone isn’t deserving of a paradise it’s Gabriel. Then again, maybe that’s why Gabriel did what he did. With Rick and his group being the only ones who know what Gabriel did to his former parish, perhaps this is Gabriel’s attempt at self preservation and cleaning his slate. This is such a horrible act of treason, I don’t think Gabriel will get away with just a simple death. He’s abandoned one group and now turned over another. Before his death comes, I believe there must be a moment of redemption in some way shape or form. Gabriel has amassed such a debt that there’s no way death can make up for it. Worse still is what this sewing of doubt will mean for the crew in the coming episodes. As for whether or not Monroe will believe Gabriel’s accusations remain to be seen. I think she’s a smart woman who understands the merit of Rick’s group as well as the failings of her own. Though regardless of what she herself thinks of Gabriel’s accusations, the amounting circumstantial evidence and crimes of opportunity will send Alexandria into a Civil War. Glenn went out of his way to bring Nicholas back because that’s what Glenn does; but also to atone for the two deaths he caused. If Glenn returned with both members of Alexandria dead, it would look a little suspicious. Though Nicholas is such a coward I wouldn’t hold it past him to lie and say that he’s innocent and the newcomers were to blame. Deanna knows her son needed help and they had a problem realizes what it’s like out there, but will she remember this rationale when she learns her son died. Add on how more and more of Rick’s group are getting positions of power and the upcoming ‘killing of Pete’, and you have all the fuel and sparks you need for an explosive confrontation. Though could there also be an outside threat looming on the horizon? Unlike some past episodes, we didn’t get a direct reference to ‘The Wolves’ whether in writing or ‘W’ mark on walker heads. That being said, we did get an indirect reference to wolves as well as a foreshadowing of something big heading in the season finale. For starters, when Gabriel called Rick’s group “false prophets”, this is a reference to Matthew 7:15 which reads, “Beware of false prophets, who come to you in sheep’s clothing but inwardly are ravenous wolves”. Now this could say that the mystery W group is something else and Rick’s group are the metaphorical ‘wolves’; but you have to remember that there is another seemingly unassuming member of Alexandria – Enid. I spoke about my theory on here a couple episodes ago and whether or not she might be working for another group – willingly or not – but she is certainly someone to watch out for. Though ‘wolves’ aside, there might be something even bigger coming to Alexandria. Outside the construction grounds there was a sign that read ‘Big Things Are Coming”. Yes the group at the site had to fend off some walkers; but I don’t think that’s the end of it. Lately we’ve been seeing more hordes of walkers than small individual groups. Could all the fighting at Alexandria – whether by a Civil War, outsider group or both – draw in a massive mega herd of walkers to Alexandria? We’ve seen mega herds destroy sanctuaries before, so it’s not outlandish to think it’d happen again. Noah also realizes that like his last home, a walled sanctuary can have the walls knocked in and overrun – which might happen again. The moments with Abraham in front of the mirror and breathing heavily reveal that he is currently in turmoil with who he truly is. He’s afraid of becoming the crazed fighter again (that scared Rosita) but he also knows that fighting walkers and leading is when he’s most comfortable. He must find his balance. Apparently DubStep survived the apocalypse as the song playing in Aiden’s car is “Internet Friends” by Knife Party. With talk of the ‘power grid’ being down, I can’t help but wonder if it was sabotaged instead of just breaking due to it being a preliminary system. Darryl’s new bike is up and running as he and Aaron go out to find more recruits. The Broken Window Theory – ‘you keep the windows intact, you keep society intact’. Rather ironic that Glenn trying to break the window glass of the revolving door is what really made Nicholas freak out and leave them all behind. Next is sure to make the tensions grow even more as we see Sasha take to the tower and Carl roaming outside the walls with the ever mysterious Enid. So be sure to stay tuned and check back for the next ‘Closer Look’. Pretty good and detailed analysis. Another ‘sort’ of comic Easter Egg was Tara mentioning that Noah had been talking to a girl named Holly, which is interesting because there is a Holly in the comic book who would be in the role that Francine played at the construction site when Abraham rescued her. I agree that Noah’s death is a waste of potential, especially since it came so soon. In hindsight, you wonder whether Noah would have been better off going back to Dawn’s side during the exchange at Grady. But, like Bob, his optimism spelled out that his end was coming soon. Thanks Omarid; and yah. The moment Noah expressed hopes and a positive outlook for the ‘long haul’, you knew he was kinda a goner.